Generalized anxiety disorder (GAD) is an anxiety disorder characterized by excessive, uncontrollable and often irrational worry, that is, apprehensive expectation about events or activities. This excessive worry often interferes with daily functioning, as individuals with GAD typically anticipate disaster, and are overly concerned about everyday matters such as health issues, money, death, family problems, friendship problems, interpersonal relationship problems, or work difficulties. Individuals often exhibit a variety of physical symptoms, including fatigue, fidgeting, headaches, nausea, numbness in hands and feet, muscle tension, muscle aches, difficulty swallowing, excessive stomach acid buildup, stomach pain, vomiting, diarrhea, bouts of breathing difficulty, difficulty concentrating, trembling, twitching, irritability, agitation, sweating, restlessness, insomnia, hot flashes, rashes, and inability to fully control the anxiety (ICD-10). These symptoms must be consistent and ongoing, persisting at least six months, for a formal diagnosis of GAD. Standardized rating scales such as GAD-7 can be used to assess severity of GAD symptoms. GAD is the most common cause of disability in the workplace in the United States. In a given year, approximately two percent of American adults and European adults experience GAD. Globally about 4% are affected at some point in their life. GAD is seen in women twice as much as men. GAD is also common in individuals with a history of substance abuse and a family history of the disorder. Once GAD develops, it may become chronic, but can be managed or eliminated with proper treatment. About a third of the variance for generalized anxiety disorder has been attributed to genes. Individuals with a genetic predisposition for GAD are more likely to develop GAD, especially in response to a life stressor. Long-term use of benzodiazepines can worsen underlying anxiety, with evidence that reduction of benzodiazepines can lead to a lessening of anxiety symptoms. Similarly, long-term alcohol use is associated with anxiety disorders, with evidence that prolonged abstinence can result in a disappearance of anxiety symptoms. However, it can take up to two years for anxiety symptoms to return to baseline in about a quarter of people recovering from alcoholism. In one study in 1988–90, illness in approximately half of patients attending mental health services at British hospital psychiatric clinic, for conditions including anxiety disorders such as panic disorder or social phobia, was determined to be the result of alcohol or benzodiazepine dependence. In these patients, anxiety symptoms, while worsening initially during the withdrawal phase, disappeared with abstinence from benzodiazepines or alcohol. Sometimes anxiety pre-existed alcohol or benzodiazepine dependence, but the dependence was acting to keep the anxiety disorders going and often progressively making them worse. Recovery from benzodiazepines tends to take a lot longer than recovery from alcohol, but people can regain their previous good health. Tobacco smoking has been established as a risk factor for developing anxiety disorders. Excessive caffeine usage has been linked to anxiety. Another area, the adjacent central nucleus of the amygdala, controls species-specific fear responses in its connections to the brainstem, hypothalamus and cerebellum areas. In those with generalized anxiety disorder, these connections seem less functionally distinct, and there is greater gray matter in the central nucleus. Another difference is that the amygdala areas have decreased connectivity with the insula and cingulate areas that control general stimulus salience, while having greater connectivity with the parietal cortex and prefrontal cortex circuits that underlie executive functions. The latter suggests a compensation strategy for dysfunctional amygdala processing of anxiety. This is consistent with cognitive theories that suggest the use in this disorder of attempts to reduce the involvement of emotions with compensatory cognitive strategies. F. The disturbance is not better explained by another mental disorder (e.g., anxiety or worry about having panic attacks in panic disorder, negative evaluation in social anxiety disorder social phobia, contamination or other obsessions in obsessive-compulsive disorder, separation from attachment figures in separation anxiety disorder, reminders of traumatic events in posttraumatic stress disorder, gaining weight in anorexia nervosa, physical complaints in somatic symptom disorder, perceived appearance flaws in body dysmorphic disorder, having a serious illness in illness anxiety disorder, or the content of delusional beliefs in schizophrenia or delusional disorder). No major changes to GAD have occurred since publication of the Diagnostic and Statistical Manual of Mental Disorders (2004); minor changes include wording of diagnostic criteria. ICD-10 Generalized anxiety disorder "F41.1"
Note: For children different criteria may be applied (see F93.80). A. A period of at least six months with prominent tension, worry and feelings of apprehension, about everyday events and problems. B. At least four symptoms out of the following list of items must be present, of which at least one from items (1) to (4). (8) Nausea or abdominal distress (e.g. churning in stomach). (13) Hot flushes or cold chills. (18) A sensation of a lump in the throat, or difficulty with swallowing. (20) Difficulty in concentrating, or mind going blank, because of worrying or anxiety. C. The disorder does not meet the criteria for panic disorder (F41.0), phobic anxiety disorders (F40.-), obsessive-compulsive disorder (F42.-) or hypochondriacal disorder (F45.2). D. Most commonly used exclusion criteria: not sustained by a physical disorder, such as hyperthyroidism, an organic mental disorder (F0) or psychoactive substance-related disorder (F1), such as excess consumption of amphetamine-like substances, or withdrawal from benzodiazepines. The American Psychiatric Association first introduced GAD as a diagnosis in the DSM-III in 1980. Prior to the introduction of this diagnosis, GAD was presented as one of the two core components of anxiety neurosis, the other being panic. The definition in the DSM-III required uncontrollable and diffuse anxiety or worry that is excessive and unrealistic, and persists for 1 month or longer. High rates in comorbidity of GAD and major depression led many commentators to suggest that GAD would be better conceptualized as an aspect of major depression instead of an independent disorder. Many critics stated that the diagnostic features of this disorder were not well established until the DSM-III-R. Since comorbidity of GAD and other disorders decreased with time, the DSM-III-R changed the time requirement for a GAD diagnosis to 6 months or longer. The DSM-IV changed the definition of excessive worry and the number of associated psychophysiologic symptoms required for a diagnosis. Another aspect of the diagnosis the DSM-IV clarified was what constitutes a symptom as occurring "often." The DSM-IV also required difficulty controlling the worry to be diagnosed with GAD. The DSM-5 emphasized that excessive worrying had to occur more days than not and on a number of different topics. It has been stated that the constant changes in the diagnostic features of the disorder have made it difficult for researchers to identify the biological and psychological underpinnings of the disorder making it difficult to create specialized medications for the disorder. This has led to the continuation of GAD being medicated heavily with SSRIs. Mental disorders are difficult to prevent, but many techniques are available to help relieve and manage anxiety. Many sufferers have found ease by relaxation exercises, deep breathing practice and meditation. Additionally, avoidance of caffeine may prevent GAD. Avoiding nicotine also can decrease the risk for the development of anxiety disorders including generalized anxiety disorder. Meta-analysis indicates that both cognitive behavioral therapy (CBT) and medications (such as SSRIs) have been shown to be effective in reducing anxiety. A comparison of overall outcomes of CBT and medication on anxiety did not show statistically significant differences (i.e. they were equally effective in treating anxiety). However, CBT is significantly more effective in reducing depression severity, and its effects are more likely to be maintained in the long term, whereas the effectiveness of pharmacologic treatment tends to lessen if medication is discontinued. A combination of both CBT and medication is generally seen as the most desirable approach to treatment. Use of medication to lower extreme anxiety levels can be important in enabling patients to engage effectively in CBT. Components of Cognitive Behavioral Therapy (CBT) for GAD includes psychoeducation, self-monitoring, stimulus control techniques, relaxation, self-control desensitization, cognitive restructuring, worry exposure, worry behavior modification, and problem-solving. The first step in the treatment of GAD is informing of the patient about the issues and the plan of solution. The purpose of psychoeducation is to provide some relief, destigmatization of the disorder, motivating, and accomplishing participation by making the patient understand the program of treatment. The purpose of this component is to identify cues that provoke the anxiety. Stimulus control intervention refers to minimizing the stimulus conditions under which worrying occurs. Relaxation techniques lower the patients' stress and thus increase attention to alternatives in feared situations (other than worrying). Deep breathing exercise, progressive muscle relaxation, and applied relaxation fall under the scope of relaxation techniques. Self-control desensitization involves patients being deeply relaxed before vividly imagining themselves in situations that usually make them anxious and worry until internal anxiety cues are triggered. Patients then imagine themselves coping with the situation and decreasing their anxious response. If anxiety diminishes, they then enter a deeper relaxed state and turn off the scene. The purpose of cognitive restructuring is to shift from a worrisome outlook to a more functional and adaptive perception of the world, the future, and the self. It involves socratic questioning that leads patients to think through their worries and anxieties so they can realize that alternative interpretations and feelings are more accurate. It also involves behavioral experiments that actually test the validity of both the negative and alternative thoughts in real-life situations. In CBT for GAD, patients also engage in worry exposure exercises during which they are asked to imagine themselves exposed to images of the most feared outcomes. Then they engage in response-prevention instruction that prevents them from avoiding the image and motivates alternative outcomes to the feared stimulus. The goals of worry exposure are habituation and reinterpretation of the meaning of the feared stimulus. Worry behavior prevention requires patients to monitor the behaviors that caused them worry and are then asked to prevent themselves from engaging in them. Instead they are encouraged to use other coping mechanisms learned earlier in the treatment. Finally, problem solving focuses on dealing with current problems through a problem-solving approach: (1) definition of the problem, (2) formulation of goals, (3) creation of alternative solutions, (4) decision-making, and (5) implementing and verifying the solutions. There is little debate regarding the effectiveness of CBT for GAD. However, there is still room for improvement because only about 50% of those who complete treatments achieve higher functioning or recovery after treatment. Therefore, there's a need for enhancement of current components of CBT. CBT usually helps one third of the patients substantially, whilst another third does not respond at all to treatment. A promising innovative approach to improving recovery rates for the treatment of GAD is to combine CBT with Motivational Interviewing (MI). Motivational Interviewing is a strategy centered on the patient that aims to increase intrinsic motivation and decrease ambivalence about change due to the treatment. MI contains four key elements; (1) express empathy, (2) heighten dissonance between behaviors that are not desired and values that are not consistent with those behaviors, (3) move with resistance rather than direct confrontation, and (4) encourage self-efficacy. It is based on asking open-ended questions and listening carefully and reflectively to patients' answers, eliciting "change talk", and talking with patients about the pros and cons of change. Some studies have shown the combination of CBT with MI more efficient than CBT alone. Pharmaceutical treatments for GAD include selective serotonin reuptake inhibitors (SSRIs). These are the preferred first line of treatment. SSRIs used for this purpose include escitalopram and paroxetine. Common side effects include nausea, sexual dysfunction, headache, diarrhea, constipation, restlessness, increased risk of suicide in young adults and adolescents, serotonin syndrome (caused by an overdose of the SSRI), among others. Benzodiazepines are most often prescribed to patients with Generalized Anxiety Disorder. Research suggests that these drugs give some relief, at least in the short term. However, they carry some risks, mainly impairment of both cognitive and motor functioning, and psychological and physical dependence that makes it difficult for patients to stop taking them. It has been noted that people taking benzodiazepines are not as alert on their job or at school. Additionally, these drugs may impair driving and they are often associated with falls in the elderly, resulting in hip fractures. These shortcomings make the use of benzodiazepines optimal only for short-term relief of anxiety. CBT and medication are of comparable efficacy in the short-term but CBT has advantages over medication in the longer term. Benzodiazepines (or "benzos") are fast-acting hypnotic sedatives that are also used to treat GAD and other anxiety disorders. Benzodiazepines are prescribed for generalized anxiety disorder and show beneficial effects in the short term. Popular Benzodiazepines for GAD include alprazolam, lorazepam and clonazepam. The World Council of Anxiety does not recommend the long-term use of benzodiazepines because they are associated with the development of tolerance, psychomotor impairment, cognitive and memory impairments, physical dependence and a withdrawal syndrome. Side effects include drowsiness, reduced motor coordination and problems with equilibrioception. Pregabalin (Lyrica) acts on the voltage-dependent calcium channel to decrease the release of neurotransmitters such as glutamate, norepinephrine and substance P. Its therapeutic effect appears after 1 week of use and is similar in effectiveness to lorazepam, alprazolam and venlafaxine but pregabalin has demonstrated superiority by producing more consistent therapeutic effects for psychic and somatic anxiety symptoms. Long-term trials have shown continued effectiveness without the development of tolerance and additionally, unlike benzodiazepines, it does not disrupt sleep architecture and produces less severe cognitive and psychomotor impairment. It also has a low potential for abuse and dependency and may be preferred over the benzodiazepines for these reasons. The anxiolytic effects of pregabalin appear rapidly after administration, similar to the benzodiazepines, which gives pregabalin an advantage over many anxiolytic medications such as antidepressants. Gabapentin (Neurontin), a closely related drug to pregabalin with the same mechanism of action, has also demonstrated effectiveness in the treatment of GAD, though unlike pregabalin, it has not been approved specifically for this indication. Nonetheless, it is likely to be of similar usefulness in the management of this condition, and by virtue of being off-patent, it has the advantage of being significantly less expensive in comparison. In accordance, gabapentin is frequently prescribed off-label to treat GAD. 5-HT1A receptor partial agonists, such as buspirone and tandospirone. Newer, atypical serotonergic antidepressants, such as vilazodone, vortioxetine, and agomelatine. Certain monoamine oxidase inhibitors (MAOIs), such as moclobemide and, rarely, phenelzine. In addition to coexisting with depression, research shows that GAD often coexists with conditions associated with stress, such as irritable bowel syndrome. Patients with GAD can sometimes present with symptoms such as insomnia or headaches as well as pain, cardiac events and interpersonal problems. Populations with a higher rate of diagnosis of GAD are individuals that are traditionally oppressed. This includes individuals with low and middle socio-economic status, separated, divorced, and widowed individuals. Women are twice as likely to develop GAD as men. This is primarily because women are more likely than men to live in poverty, be subject to discrimination, and be sexually and physically abused. African Americans have significantly higher odds of enduring GAD and the disorder often manifests itself in different patterns. Other populations that are more diagnosed with GAD are those who live alone, those with a low level of education, and the unemployed. GAD is also common in the elderly population. A study on comorbidity of GAD and other depressive disorders has shown that treatment is not more or less effective when there is some sort of comorbidity of another disorder. The severity of symptoms did not affect the outcome of the treatment process in these cases. 1 2 3 4 Association, American Psychiatric (2013). Diagnostic and statistical manual of mental disorders : DSM-5. (5th ed.). Washington, D.C.: American Psychiatric Association. p. 222. ISBN 978-0-89042-554-1. 1 2 "What Is Generalized Anxiety Disorder? ", National Institute of Mental Health. Accessed 28 May 2008. ↑ Torpy, Janet M.; Burke, AE; Golub, RM (2011). "Generalized Anxiety Disorder". JAMA. 305 (5): 522. doi:10.1001/jama.305.5.522. PMID 21285432. ↑ Spitzer, Robert L.; Kroenke, K; Williams, JB; Löwe, B (2006). 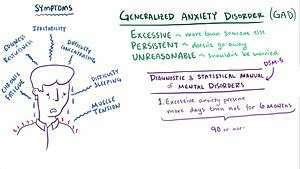 "A Brief Measure for Assessing Generalized Anxiety Disorder". Archives of Internal Medicine. 166 (10): 1092–7. doi:10.1001/archinte.166.10.1092. PMID 16717171. ↑ Ballenger, JC; Davidson, JR; Lecrubier, Y; Nutt, DJ; Borkovec, TD; Rickels, K; Stein, DJ; Wittchen, HU (2001). "Consensus statement on generalized anxiety disorder from the International Consensus Group on Depression and Anxiety". The Journal of Clinical Psychiatry. 62 Suppl 11: 53–8. PMID 11414552. 1 2 "The Numbers Count", National Institute of Mental Health. Accessed 28 May 2007. ↑ Lieb, Roselind; Becker, Eni; Altamura, Carlo (2005). "The epidemiology of generalized anxiety disorder in Europe". European Neuropsychopharmacology. 15 (4): 445–52. doi:10.1016/j.euroneuro.2005.04.010. PMID 15951160. ↑ "In The Clinic: Generalized Anxiety Disorder". Annals Of Internal Medicine. 159 (11). 2013. ↑ Rickels, K; Schweizer, E (1990). "The clinical course and long-term management of generalized anxiety disorder". Journal of Clinical Psychopharmacology. 10 (3 Suppl): 101S–110S. doi:10.1097/00004714-199006001-00017. PMID 1973934. ↑ Hettema, J. M.; Neale, MC; Kendler, KS (2001). "A Review and Meta-Analysis of the Genetic Epidemiology of Anxiety Disorders". American Journal of Psychiatry. 158 (10): 1568–78. doi:10.1176/appi.ajp.158.10.1568. PMID 11578982. ↑ Donner, Jonas; Pirkola, Sami; Silander, Kaisa; Kananen, Laura; Terwilliger, Joseph D.; Lönnqvist, Jouko; Peltonen, Leena; Hovatta, Iiris (2008). "An Association Analysis of Murine Anxiety Genes in Humans Implicates Novel Candidate Genes for Anxiety Disorders". Biological Psychiatry. 64 (8): 672–80. doi:10.1016/j.biopsych.2008.06.002. PMC 2682432 . PMID 18639233. ↑ Galanter, Marc (1 July 2008). The American Psychiatric Publishing Textbook of Substance Abuse Treatment (American Psychiatric Press Textbook of Substance Abuse Treatment) (4 ed.). American Psychiatric Publishing, Inc. p. 197. ISBN 978-1-58562-276-4. ↑ Ashton, Heather (2005). "The diagnosis and management of benzodiazepine dependence". Current Opinion in Psychiatry. 18 (3): 249–55. doi:10.1097/01.yco.0000165594.60434.84. PMID 16639148. ↑ Lindsay, S.J.E. ; Powell, Graham E., eds. (28 July 1998). The Handbook of Clinical Adult Psychology (2nd ed.). Routledge. p. 173. ISBN 978-0-415-07215-1. ↑ Cargiulo, T. (2007). "Understanding the health impact of alcohol dependence". American Journal of Health-System Pharmacy. 64 (5 Supplement 3): S5–11. doi:10.2146/ajhp060647. PMID 17322182. ↑ Wetterling, T; Junghanns, K (2000). "Psychopathology of alcoholics during withdrawal and early abstinence". European Psychiatry. 15 (8): 483–8. doi:10.1016/S0924-9338(00)00519-8. PMID 11175926. 1 2 Cohen, SI (1995). "Alcohol and benzodiazepines generate anxiety, panic and phobias". Journal of the Royal Society of Medicine. 88 (2): 73–7. PMC 1295099 . PMID 7769598. ↑ Morissette, Sandra Baker; Tull, Matthew T.; Gulliver, Suzy Bird; Kamholz, Barbara Wolfsdorf; Zimering, Rose T. (2007). "Anxiety, anxiety disorders, tobacco use, and nicotine: A critical review of interrelationships". Psychological Bulletin. 133 (2): 245–72. doi:10.1037/0033-2909.133.2.245. PMID 17338599. ↑ Bruce M. S., Lader M.; Lader (2009). "Caffeine abstention in the management of anxiety disorders". Psychological Medicine. 19 (1): 211–4. doi:10.1017/S003329170001117X. PMID 2727208. 1 2 3 Etkin, Amit; Prater, Katherine E.; Schatzberg, Alan F.; Menon, Vinod; Greicius, Michael D. (2009). "Disrupted Amygdalar Subregion Functional Connectivity and Evidence of a Compensatory Network in Generalized Anxiety Disorder". Archives of General Psychiatry. 66 (12): 1361–72. doi:10.1001/archgenpsychiatry.2009.104. PMID 19996041. ↑ Möller, Hans-Jürgen; Bandelow, Borwin; Bauer, Michael; Hampel, Harald; Herpertz, Sabine C.; Soyka, Michael; Barnikol, Utako B.; Lista, Simone; Severus, Emanuel; Maier, Wolfgang (26 August 2014). "DSM-5 reviewed from different angles: goal attainment, rationality, use of evidence, consequences—part 2: bipolar disorders, schizophrenia spectrum disorders, anxiety disorders, obsessive–compulsive disorders, trauma- and stressor-related disorders, personality disorders, substance-related and addictive disorders, neurocognitive disorders". European Archives of Psychiatry and Clinical Neuroscience. 265: 87–106. doi:10.1007/s00406-014-0521-9. 1 2 Kessler, Ronald C.; Keller, Martin B.; Wittchen, Hans-Ulrich (1 March 2001). "The Epidemiology of Generalized Anxiety Disorder". Psychiatric Clinics of North America. doi:10.1016/S0193-953X(05)70204-5. 1 2 3 Craighead, W. Edward (2013). Psychopathology: History, Diagnosis, and Empirical Foundations. John Wiley & Sons, Inc.
↑ Breslau, Naomi; Davis, Glenn C. (July 1985). "DSM-III generalized anxiety disorder: An empirical investigation of more stringent criteria". Psychiatry Research. doi:10.1016/0165-1781(85)90080-0. ↑ Wittchen, Hans-Ulrich; Kessler, Ronald C.; Zhao, Shanyang; Abelson, Jamie (March–April 1995). "Reliability and clinical validity of UM-CIDI DSM-III-R generalized anxiety disorder". Journal of Psychiatric Research. doi:10.1016/0022-3956(94)00044-R.
↑ Dinsmoor, Robert Scott; Odle, Teresa G. (2015). "Generalized Anxiety Disorder". The Gale Encyclopedia of Medicine. 4 (5): 2149–2150. ↑ Bruce, M. S.; Lader, M. (2009). "Caffeine abstention in the management of anxiety disorders". Psychological Medicine. 19 (1): 211–4. doi:10.1017/S003329170001117X. PMID 2727208. ↑ Morissette, SB; Tull, MT; Gulliver, SB; Kamholz, BW; Zimering, RT (March 2007). "Anxiety, anxiety disorders, tobacco use, and nicotine: a critical review of interrelationships.". Psychological Bulletin. 133 (2): 245–72. doi:10.1037/0033-2909.133.2.245. PMID 17338599. ↑ Gould, Robert A.; Otto, Michael W.; Pollack, Mark H.; Yap, Liang (1997). "Cognitive behavioral and pharmacological treatment of generalized anxiety disorder: A preliminary meta-analysis". Behavior Therapy. 28 (2): 285–305. doi:10.1016/S0005-7894(97)80048-2. ↑ Bandelow, Borwin; Sher, Leo; Bunevicius, Robertas; Hollander, Eric; Kasper, Siegfried; Zohar, Joseph; Möller, Hans-Jürgen (June 2012). "Guidelines for the pharmacological treatment of anxiety disorders, obsessive–compulsive disorder and posttraumatic stress disorder in primary care" (PDF). International Journal of Psychiatry in Clinical Practice. 16 (2): 77–84. doi:10.3109/13651501.2012.667114. PMID 22540422. Retrieved 24 November 2015. 1 2 Behar, Evelyn; Dimarco, Ilyse Dobrow; Hekler, Eric B.; Mohlman, Jan; Staples, Alison M. (2009). "Current theoretical models of generalized anxiety disorder (GAD): Conceptual review and treatment implications". Journal of Anxiety Disorders. 23 (8): 1011–23. doi:10.1016/j.janxdis.2009.07.006. PMID 19700258. 1 2 3 4 5 6 Hoyer, Jürgen; van der Heiden, Colin; Portman, Michael E. (February 2011). "Psychotherapy for Generalized Anxiety Disorder". Psychiatric Annals. 41 (2): 87–94. doi:10.3928/00485713-2011203-07 (inactive 2015-02-01). ↑ "A Guide to Understanding Cognitive and Behavioural Psychotherapies", British Association for Behavioural and Cognitive Psychotherapies. Accessed 29 May 2007. 1 2 3 "Generalized anxiety disorder", Mayo Clinic. Accessed 29 May 2007. ↑ Barlow, D. H.: (2007) Clincical Handbook of Psychological Disorders, 4th ed. ↑ Roemer, Lizabeth; Orsillo, Susan M. (2006). "Expanding Our Conceptualization of and Treatment for Generalized Anxiety Disorder: Integrating Mindfulness/Acceptance-Based Approaches with Existing Cognitive-Behavioral Models". Clinical Psychology: Science and Practice. 9: 54–68. doi:10.1093/clipsy.9.1.54. ↑ Smout, M (2012). "Acceptance and commitment therapy - pathways for general practitioners". Australian family physician. 41 (9): 672–6. PMID 22962641. 1 2 Baldwin, DS; Allgulander, C; Bandelow, B; Ferre, F; Pallanti, S (Oct 2012). "An international survey of reported prescribing practice in the treatment of patients with generalised anxiety disorder.". The World Journal of Biological Psychiatry. 13 (7): 510–6. doi:10.3109/15622975.2011.624548. PMID 22059936. ↑ Wagstaff, Antona J.; Cheer, Susan M.; Matheson, Anna J.; Ormrod, Douglas; Goa, Karen L. (2002-01-01). "Paroxetine: an update of its use in psychiatric disorders in adults". Drugs. 62 (4): 655–703. doi:10.2165/00003495-200262040-00010. ISSN 0012-6667. PMID 11893234. ↑ "Antidepressant Medications for Children and Adolescents: Information for Parents and Caregivers". NIMH. National Institute of Mental Health. Retrieved 1 September 2015. ↑ Barlow, D. H., & Durand, V. M. (2009). Abnormal Psychology: An Integrative Approach. 5th Edition. Belmont: Wadsworth Cengage Learning. ↑ Durham, Rob C. (2007). "Treatment of generalized anxiety disorder". Psychiatry. 6 (5): 183–187. doi:10.1016/j.mppsy.2007.03.003. ↑ Allgulander, C; Bandelow, B; Hollander, E; Montgomery, SA; Nutt, DJ; Okasha, A; Pollack, MH; Stein, DJ; Swinson, RP; World Council Of, Anxiety (2003). "WCA recommendations for the long-term treatment of generalized anxiety disorder". CNS spectrums. 8 (8 Suppl 1): 53–61. PMID 14767398. ↑ Stewart, S.; Westra, H. (2002). "Introduction to the Special Issue on: Benzodiazepine Side-Effects: From the Bench to the Clinic". Current Pharmaceutical Design. 8 (1): 1–3. doi:10.2174/1381612023396708. PMID 11812246. ↑ Bandelow, Borwin; Wedekind, Dirk; Leon, Teresa (2007). "Pregabalin for the treatment of generalized anxiety disorder: A novel pharmacologic intervention". Expert Review of Neurotherapeutics. 7 (7): 769–81. doi:10.1586/14737175.7.7.769. PMID 17610384. ↑ Owen, R.T. (2007). "Pregabalin: Its efficacy, safety and tolerability profile in generalized anxiety". Drugs of Today. 43 (9): 601–10. doi:10.1358/dot.2007.43.9.1133188. PMID 17940637. ↑ Wensel, T. M.; Powe, K. W.; Cates, M. E. (2012). "Pregabalin for the Treatment of Generalized Anxiety Disorder". Annals of Pharmacotherapy. 46 (3): 424–9. doi:10.1345/aph.1Q405. PMID 22395254. ↑ Rif S. El-Mallakh; S. Nassir Ghaemi (2 April 2007). Bipolar Depression: A Comprehensive Guide. American Psychiatric Pub. p. 158. ISBN 978-1-58562-651-9. ↑ Stephen M. Stahl; Bret A. Moore (13 February 2013). Anxiety Disorders: A Guide for Integrating Psychopharmacology and Psychotherapy. Routledge. p. 65. ISBN 978-1-136-44588-0. ↑ D. John Reynolds; Jamie Coleman; Jeffrey Aronson (10 November 2011). Oxford Handbook of Practical Drug Therapy. Oxford University Press. p. 765. ISBN 978-0-19-956285-5. ↑ Moffitt, Terrie E.; Harrington, H; Caspi, A; Kim-Cohen, J; Goldberg, D; Gregory, AM; Poulton, R (2007). "Depression and Generalized Anxiety Disorder". Archives of General Psychiatry. 64 (6): 651–60. doi:10.1001/archpsyc.64.6.651. PMID 17548747. ↑ Wolitzky-Taylor, Kate B.; Castriotta, Natalie; Lenze, Eric J.; Stanley, Melinda A.; Craske, Michelle G. (2010). "Anxiety disorders in older adults: A comprehensive review". Depression and Anxiety. 27 (2): 190–211. doi:10.1002/da.20653. PMID 20099273. ↑ Smith, Joshua P.; Book, Sarah W. (2010). "Comorbidity of generalized anxiety disorder and alcohol use disorders among individuals seeking outpatient substance abuse treatment". Addictive Behaviors. 35 (1): 42–5. doi:10.1016/j.addbeh.2009.07.002. PMC 2763929 . PMID 19733441. ↑ Lee, S.; Wu, J.; Ma, Y. L.; Tsang, A.; Guo, W.-J. ; Sung, J. (2009). "Irritable bowel syndrome is strongly associated with generalized anxiety disorder: A community study". Alimentary Pharmacology & Therapeutics. 30 (6): 643–651. doi:10.1111/j.1365-2036.2009.04074.x. PMID 19552631. ↑ "Access". Medscape. Retrieved 2013-01-15. 1 2 "Relating the burden of anxiety and depression to effectiveness of treatment", World Health Organization. ↑ Kessler, Ronald C.; Chiu, WT; Demler, O; Merikangas, KR; Walters, EE (2005). "Prevalence, Severity, and Comorbidity of 12-Month DSM-IV Disorders in the National Comorbidity Survey Replication". Archives of General Psychiatry. 62 (6): 617–27. doi:10.1001/archpsyc.62.6.617. PMC 2847357 . PMID 15939839. ↑ Grant, Bridget F.; Hasin, Deborah S.; Stinson, Frederick S.; Dawson, Deborah A.; June Ruan, W.; Goldstein, Risë B.; Smith, Sharon M.; Saha, Tulshi D.; Huang, Boji (2005). "Prevalence, correlates, co-morbidity, and comparative disability of DSM-IV generalized anxiety disorder in the USA: Results from the National Epidemiologic Survey on Alcohol and Related Conditions". Psychological Medicine. 35 (12): 1747–59. doi:10.1017/S0033291705006069. PMID 16202187. ↑ Robins LN, Regier DA, eds. Psychiatric disorders in America: the Epidemiologic Catchment Area Study. New York: The Free Press, 1991. ↑ Albano, Anne Marie; Chorpita, Bruce F.; Barlow, David H. (2003). "Childhood Anxiety Disorders". In Mash, Eric J.; Barkley, Russell A. Child Psychopathology (2nd ed.). New York: Guilford Press. pp. 279–329. ISBN 978-1-57230-609-7. ↑ Keeton, CP; Kolos, AC; Walkup, JT (2009). "Pediatric generalized anxiety disorder: epidemiology, diagnosis, and management.". Paediatric drugs. 11 (3): 171–83. doi:10.2165/00148581-200911030-00003. PMID 19445546. ↑ "The relationship between perceived discrimination and Generalized Anxiety Disorder among African Americans, Afro Caribbeans, and non-Hispanic Whites". Journal of Anxiety Disorders. March 2011. doi:10.1016/j.janxdis.2010.09.011. ↑ "Anxiety disorders research with African Americans: Current status.". Psychological Bulletin. May 1991. doi:10.1037/0033-2909.109.3.400. ↑ "Socioeconomic correlates of generalized anxiety disorder and major depression in primary care: The GADIS II study (Generalized Anxiety and Depression Impact Survey II)". Depression and Anxiety. 26 June 2007. doi:10.1002/da.20306. ↑ Cameron, Alasdair (2004). Crash Course Psychiatry. Elsevier Ltd. ISBN 0-7234-3340-2. ↑ Newman, Michelle; Przeworski, Amy; Fisher, Aaron; Borkovec, Thomas (2010). "Diagnostic Comorbidityin Adults With Generalized Anxiety Disorder: Impact of Comorbidity on Psychotherapy Outcome and Impact of Psychotherapy on Comorbidity Diagnoses". Behav Ther. 41: 59–72. doi:10.1016/j.beth.2008.12.005. PMC 2827339 . PMID 20171328. Brown, T.A., O'Leary, T.A., & Barlow, D.H. (2001). Generalised anxiety disorder. In D.H. Barlow (Ed. ), Clinical handbook of psychological disorders: A step-by-step treatment manual (3rd ed.). New York: Guilford Press. Barlow, D. H., & Durand, V. M. (2005). Abnormal psychology: An integrative approach. Australia; Belmont, CA: Wadsworth.